Digital photography may be the wave of the future (and the present), but chances are that you still have a collection of paper photos in your home. Family photographs connect you to family and friends in a unique way, preserving memories in color or black and white for generations to come. They are treasures, and they should be treated as such. Safely storing your photos takes a little bit of knowledge and preparation. The things that will ruin paper photographs the most quickly are fire, water, fading, scratches, and chemical damage. 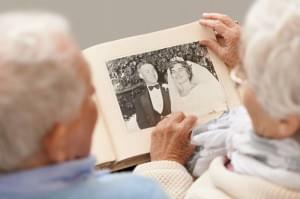 Proper handling and storage will go a very long way to preserving your precious memories intact. Storage units can actually be one of the best places to keep family albums safe from harm because photos are stored away from sticky fingers, carelessly placed glasses of liquids, or excessive handling. The best way to save your photos is to put them into albums or qualified storage boxes. Organize albums however you like, but make sure that you use only archival-quality albums, paper, and storage boxes to do the job. Each page, sleeve, album, or box in which you organize and store you photos should only include materials that have passed the ANSI IT9.16 Photographic Activity Test (PAT), meaning that those materials will not leach color or damage your photos in any way over time. Cheap albums that are not PAT certified contain bleaches, chemicals, glues, plastics, and other materials that could actively damage the integrity of any photo. Craft stores, photography supply stores and websites, and scrapbooking stores will carry PAT certified photo storing materials. While photographs are safest in a place where they are not being handled or actively damaged, you still need to choose a self-storage unit with care. For photos, humidity and temperature fluctuations are significant factors in degradation. Choose a unit that is climate controlled, inward facing (into a hallway or corridor), and preferably on the second floor, if the self-storage company has a second floor. By combining PAT certified albums, scrapbooks, and other organizing systems with a clean, climate controlled environment, you can safely store your family photos without worry of damage to your precious heirlooms. Value Store It offers self-storage units in a variety of sizes and options, including climate controlled units. Choose from one of our multiple convenient locations throughout Florida, New York, and Connecticut by visiting our Home page today.